We have original science fiction by Brooke Bolander (“And You Shall Know Her by the Trail of Dead”) and Caroline M. Yoachim (“Red Planet”), along with SF reprints by John Kessel (“Buffalo”) and David Barr Kirtley (“Veil of Ignorance”). Plus, we have original fantasy by Maria Dahvana Headley (“And the Winners Will Be Swept Out to Sea”) and Will Kaufman (“Things You Can Buy for a Penny”), and fantasy reprints by Mary Rickert (“The Girl Who Ate Butterflies”) and Adam-Troy Castro (“Cerile and the Journeyer”). 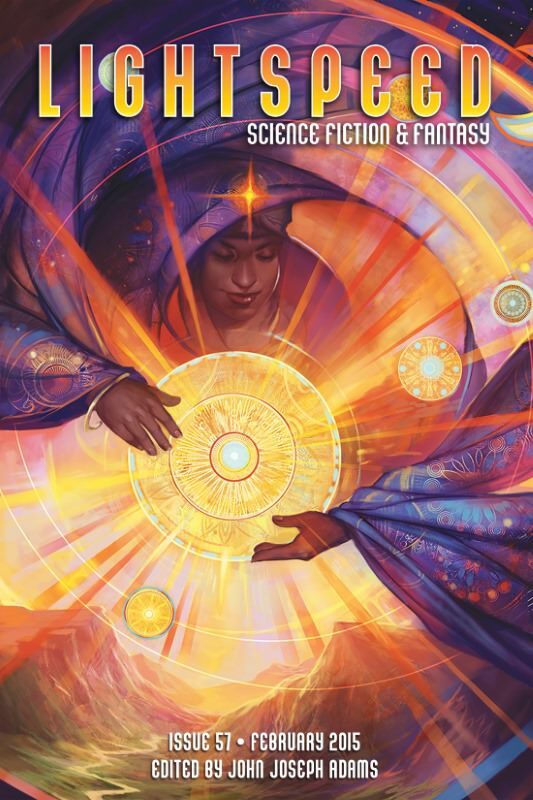 All that, and of course we also have our usual assortment of author and artist spotlights, a feature interview with Ann Leckie, and our review column, this month written by Sunil Patel. For our ebook readers, we also have an ebook-exclusive novella reprint of “In the House of Aryaman, A Lonely Signal Burns,” by Elizabeth Bear. We’re also delighted to share an excerpt from Elizabeth Bear’s new novel, KAREN MEMORY, and an excerpt from GEMINI CELL, Myke Cole’s latest book.